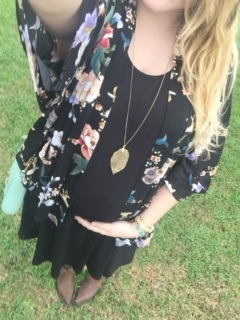 I have been obsessed with the boho look while I have been pregnant!! There is just something about the fit and the fabrics that are just so comfy and super flattering. The loose fabrics, the fun prints… it all make for a very happy baby belly. Here are a few outfit examples that I have recently worn that fit within this super fun trend. For this outfit I paired a floral kimono over one of my favorite black dresses. I finished the look off with a dainty leaf necklace and cowboy boots. The kimono is from Forever 21 and the black dress is from Old Navy. I was super comfy in these fun palazzo pants from Forever 21. 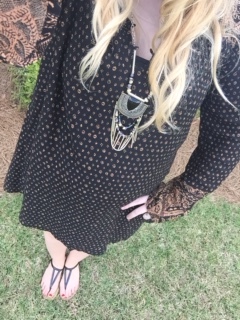 I paired it with a pretty lace blouse from Belk and a fun tiered necklace from Target. Dresses have been a staple this pregnancy and this one was no exception. I love the loose, flowy sleeves and the boho pattern. It paired perfectly with this fun necklace. Both the dress and the necklace are from Forever 21. It was a jeans and a t-shirt kind of day with this outfit but they were definitely not your ordinary jeans and tee. The jeans are super distressed and light wash and the top was loose and flowy. I paired it with some pretty blue jewelry from Forever 21. The top is also Forever 21 and the jeans were from Target. This outfit was probably one of my favorite outfits that I have worn recently. It was a warm day but I still wanted that layered look. To solve the problem I just used a men’s button up as a layering piece. 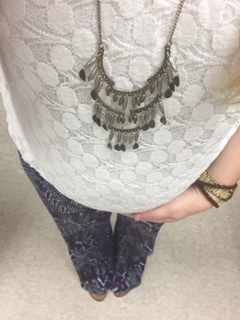 The larger size allowed for plenty of room for my baby belly and I had a much wider variety of patterns and prints to choose from. 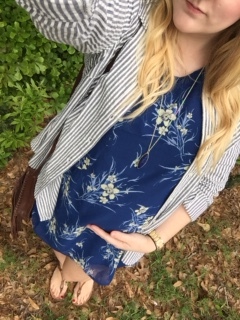 This particular button up was purchased at Old Navy and I love how the grayish-blue stripes paired with this blue floral dress from urban Outfitters. Some fun leather accessories were the perfect touch to finish off this outfit. I hope you enjoyed these ideas!! 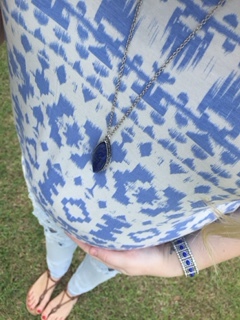 I would love to know what any of you other ladies rocked during your pregnancy!! Let me know in the comments below! !